“Life Guard Speeds to Drowning Swimmer on Motorized Surfboard SURFBOARD riders won’t have to depend on outboard motors or speed boats to pull them over the water in the future. Below is shown a motorized surfboard scooter recently invented in Australia. The small motor in the rear furnishes the power and also sets the board at the proper angle in the water. A good machine for life guards.” The photo accompanying the article appears to have had some 1930’s artistic photoshop work done to it, but the other photos from Bondi beach are not touched up. In summary, this jet board was both uncomfortable and impractical and unlikely to have made it past various prototypes. But hats off to the pioneering visionaries who created the first motorised surfboard! Circa 1948, Hollywood inventor Joe Gilpin invented his motorised surfboard and although it was 13 years after the original Australian design this board definitely looked more promising and would have been expected to take off but other than a photo of Joe crossing a river or lake on his motorised surfboard while wearing a suit and hat the motorised surfboard seems to be referred to as a failed invention. We believe Joe actually had something here but a Hollywood star in a suit crossing a river was no way to market the board. This board in the right hands of the right person on the right day with the right wave could really have taken off. Had Joe been a Californian surfer we may have seen the beginning of the jet motorised surfboard era in 1948. Circa 1960…now we are getting somewhere. The legendary surfboard pioneer Hobart “Hobie” Alter had the great idea of fitting an outboard motor to one of his surfboards. 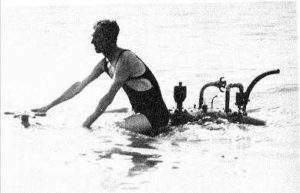 Quite possibly not the safest of the motorised surfboards but most definitely the fastest and most practical of inventions. You can clearly see by the photo below and the wake of water behind Hobie that he was able to reach some high speeds and the motorised surfboard did turn. Whether it turned easily or on command is unknown but it sure did look like fun for the brave surfer who didn’t mind losing a limb for a good thrill and adrenaline rush! Circa 1982. Motorized surf board that cost $2,000 to manufacture, 10’6′ tall, weighed fifty-pound and was propelled by two expensive nicad batteries. 63 year old Neil Townsend, the creator of Aqua Jet honeycomb surfboards, developed the board for his personal use, because of a permanent heart condition which would have otherwise entirely ended his surfing career. Neil rode the board in surf up to ten feet in California and Hawaii. Powered by a propeller, the board was activateded when the rider laid on the control pad, and stoped when he stood up. The board moved forward as fast as a strong paddler could paddle an equivalent-sized board. At the time the impact of this design was of little consequence to surfing, but as Neil pointed out; the power cells being developed were lighter, more powerful and cheaper than the ones he was using. Neil pointed out that in ten years his extensive research may payoff for somebody. Circa 1992 many more prototypes were poping up on beaches and laying around in workshops and we are sure that Neils original ideas were the basis for a lot of these jet boards. In an interview with Surfer magazine in 1982 Neil said “And who’s to say -one day we may see powered boards at Sunset or Waimea Bay flying through impossible sections on those big, unsurfable offshore days.” How right Neil was and that day is finally here.